1,657 people have read this article! More work or More Water ? Mixing mortar is something that every do-it-yourselfer does at some point — and very few get right the first time. I hear lots of complaints that the bag doesn’t have instructions on how much water to use; the result is usually sloppy, wet, guesswork. 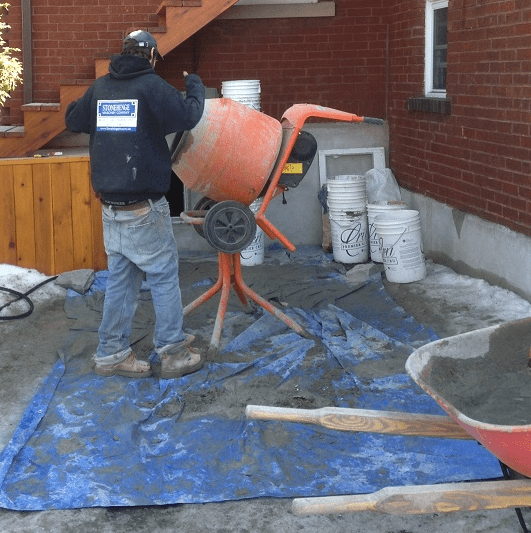 There’s a good reason why there is no water ratio: the cement and sand can have different amount of water already saturated into the material. On dry days, the bag contents will be relatively dry, and more water will be needed. If the climate or day is wet, the contents may already be moist, and the mortar will turn to soup if you add the same amount of water as on a dry day. The best approach is add water slowly. You can always add more later, but it’s impossible to take away once the water has been mixed. When you add water, you are basically squeezing a water molecule together with a cement and a sand molecule to form a compound. If you add the water and quickly stir it up, the mortar will be wet, but you won’t actually create the proper compound. Essentially, you’d have molecules sitting beside one another, resulting in a weak mix. Why does adding water make the mix weak? The answer is simple. If 20% of the mix volume is water, when the water evaporates 20% of the volume will disappear leaving you a density of only 80%. If you make another mix with 10% water and simply mix the mortar for longer (work!) you can achieve the same workability but the mortar will be more densely since only 10% of the volume has dissipated. So if you are ever mixing mortar, just remember this simple rule. ← Why do bricks have holes?